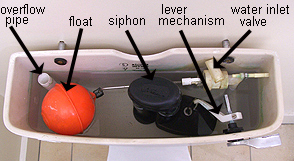 A toilet cistern pictured from above with traditional type ball float, siphon, and lever. Also check that the flush lever is properly attached to the flush handle and properly attached to the siphon with its metal hook. Sometimes the flush lever gets seized up. The central shaft should run freely within the plastic shaft that bolts onto the cistern. You may need to replace the handle and handle mechanism. 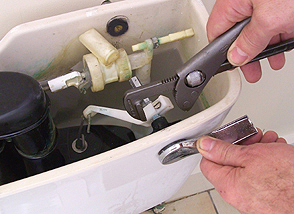 Use a footprint wrench to remove the retaining bolt and unhook the metal hook attaching it to the siphon. If that all looks fine then you will need to tackle the siphon. .
First isolate the water to the cistern. Then flush it to empty the cistern. Remove the little bit of water from the bottom as best you can with a sponge. 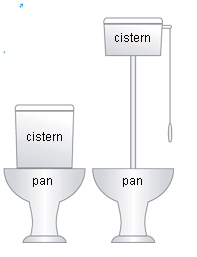 If your cistern is separate to the wc pan then it's a bit easier to remove the siphon than the more modern close coupled type. This is quite straight forward. 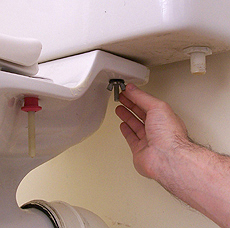 Unscrew the large plastic nut under the cistern. This holds the water pipe in place. When you've slackened it that should reveal another nut holding the siphon in place. Unscrew that to loosen the siphon. Inside the cistern disconnect the now loose siphon from the hook attaching it to the flush lever and it should then pull out. These involve a bit more work as you have to completely detach the cistern from the wall to get at the plastic nut holding the siphon in place. After turning of the water supply disconnect the water intake pipe and the over flow pipe using a footprint wrench. With a close couples cistern there are a couple of metal butterfly nuts holding down a metal bracket and a large rubber seal which clamp the cistern and pan together. Unscrew the butterfly nuts. If you can't do it with fingers use mole grips to loosen them. (or try a little lubricating fluid like WD40). After disconnecting the cistern from the pan next you'll have to unscrew the two retaining screws which hold the cistern to the wall. 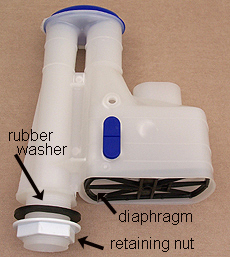 The cistern can then lift off completely to give access to the plastic nut holding the siphon in place.